Desirable oceanfront duplex, 6 bedrooms, 5.5 baths, with oceanfront pool shared with the EE side of duplex and within walking distance to the center of town where you will find restaurants, shops, arcade and amusements. NEW leather sectional in living area in 2018. Fully equipped, upgraded kitchen with stainless steel appliances and solid surface counters, including counter seating. Washer/dryer conveniently located off of the kitchen. Other amenities include 7 flat panel TVs, including large screen in living area, 2 DVDs, wireless internet, local phone calling, ceiling fans throughout, outside porch swing, outside showers and rinse off and charcoal grill. Covered porch and sundeck to enjoy the wonderful ocean views. Poolside and deck furniture and private walkway to the beach. All beds are made and bath linens provided are provided with this rental. Sleeps 20 as follows: Upstairs—queen, double/double, 2 bunk beds, double/double. Downstairs—queen/single, double/single. In the bunkbed room there is a small low-ceiling loft accessible by a wall ladder. This is a perfect tuck away spot that has a futon and its own TV-ideal for a little quiet time or a kid’s play area. Non-smoking. No pets. Great family place at the beach! This 6 bedroom duplex was great for our week at the beach. 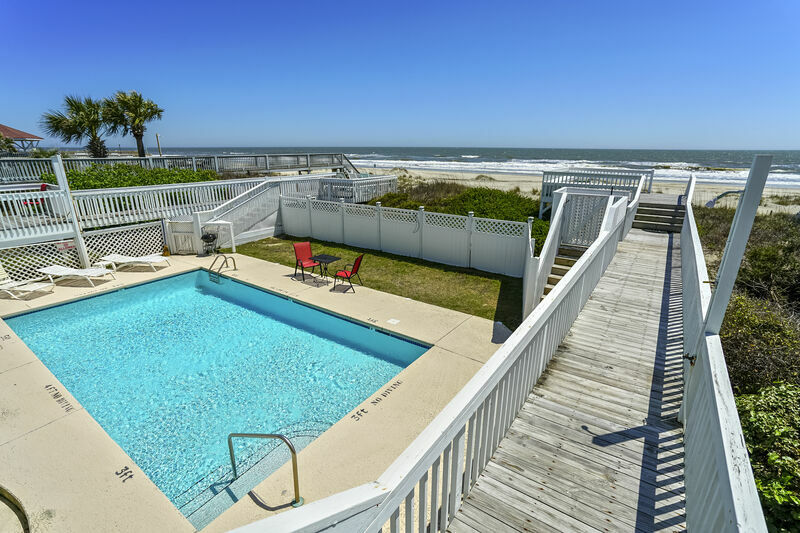 The house is clean and nicely decorated, and the oceanfront views are beautiful. We really enjoyed relaxing on the porch overlooking the pool and the ocean. The beach is expansive, even at high tide there was a huge area for bocce, football and other beach games. The kitchen could use more equipment like a colander and electric griddle. And the cleaning crew could check to replace light bulbs. Otherwise a fun and relaxing place to stay.